Scroll down to see photos from previous work parties. Work parties on Thursdays are part of a project where ParkWork are working in green spaces across St George and anyone is welcome to volunteer to join them. Conservation work parties run for two hours. We supply gloves and tools but please wear long sleeves and suitable footwear. Saturday work parties finish with a chat over a cold drink, coffee or tea and biscuits. 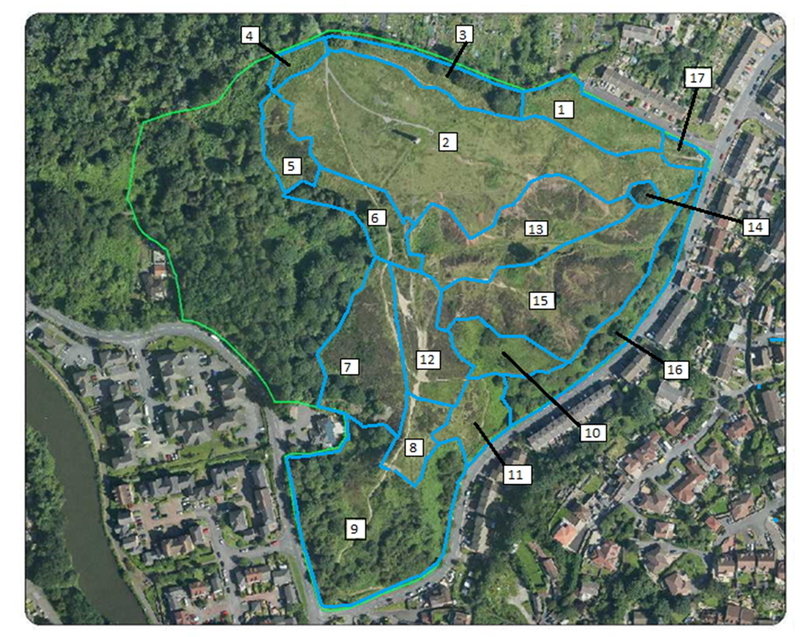 The work we do is agreed with Bristol Parks and helps to ensure that Troopers Hill Local Nature Reserve is managed for wildlife and people in accordance with the Management Plan. Please join us to help look after this unique space. You can see the type of work we do by looking at the reports of past work parties below. 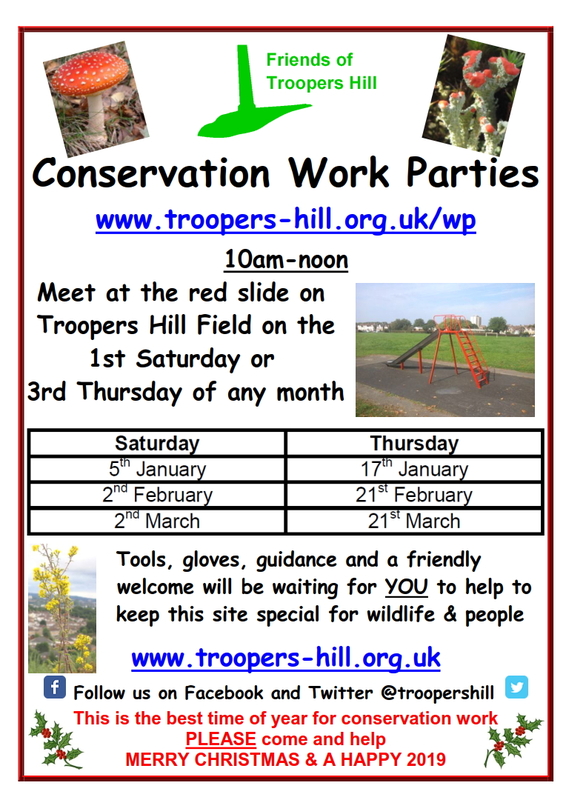 If you are a member of a group or represent a company who would like to visit to work on Troopers Hill, perhaps as part of a team building exercise or similar then please see our information sheet for Corporate or Group Volunteering (pdf) and get in touch, we would be pleased to see you. 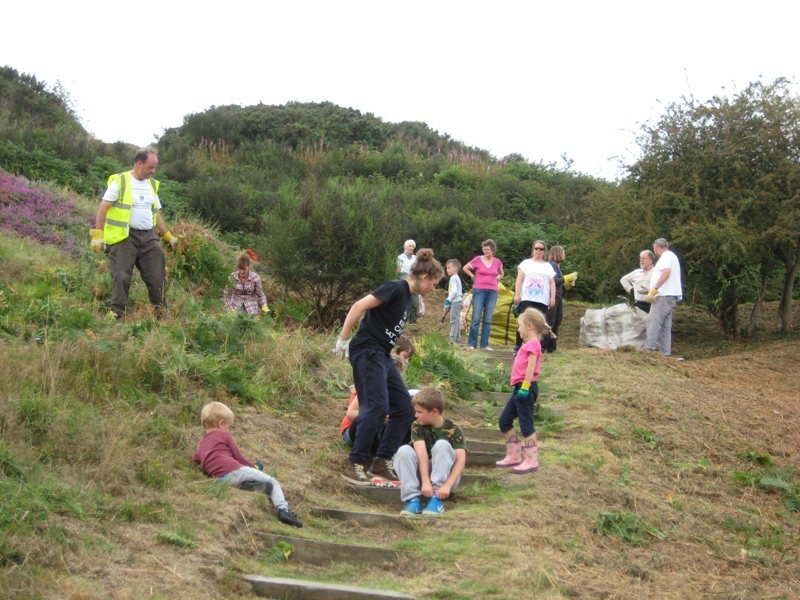 Our Work Parties on Troopers Hill are a fun way of helping maintain the environment of the site for everyone’s benefit. However, we have to ensure that the work we do is carried out safely. We work in accordance with the requirements of Bristol Parks' Health and Safety Support Pack and ask all our volunteers to read and complete the Works Party Information and Registration Form. Each Work Party is led by someone who has been trained by Bristol Parks and has been assessed to be a 'competent' person. Bristol Parks supply generic risk assessments for the tasks we carry out and we then complete our own risk assessment for the site specific issues; a typical assessment is shown here. By complying with this scheme we ensure that our activities are covered by Bristol City Council insurance. Parkwork were unable to join us today, but they will be doing an extra session next week instead. Our small group focused on clearing some isolated gorse plants from the heather. Remove all gorse, broom, scrub, tree saplings and seedlings by pulling and cutting. Nine volunteers spent time cutting back brambles and saplings from the heather and picking litter. There was some broken pottery in the children’s enclosed play area. This has now been swept up. Work focused on clearing bramble, scrub and saplings at the top of the Hill. We were pleased to be joined by three students from the University of Bristol as well as our own volunteers and those from ParkWork. On a mild but mostly cloudy morning we focused on an area of broom that has appeared in the heathland above Troopers Hill Rd over the last couple of years. The new Management Plan produced as part of our Ways to Nature Project funded by the National Lottery Heritage Fund has highlighted that we need to remove broom on parts of the Hill to protect the heathland and this was one of the areas that was considered to be of high priority. We stacked the broom near the access gate for Bristol Parks to collect during the week - having arranged this with them in advance. Also as part of our Ways to Nature Project the wooden fencing along Troopers Hill is going to be replaced, with the work due to start in mid-March. ParkWork were unable to join us today because of holidays but there was a good turnout on a very mild morning. We returned to Sally's Glade to push back the scrub at the south-western edge. Some of the bramble here had been cleared by ParkWork with their strimmer last month allowing us to access the thicker scrub. In accordance with the new management plan we left a few isolated broom plants. Some of the group also carried out a litter pick before we all were able to enjoy coffee and biscuits looking at the view over Bristol. The snow from the day before was still on the ground and although the morning was sunny it was very frosty and slippery underfoot. As a result we had to cancel today's work party. On a glorious sunny morning we first cleared some gorse and broom from the area on the south side of the gully. Having filled three large builder's sacks with material for composting, we moved over to Sally's Glade to clear some saplings and bramble from the areas at the edges of the glade. Our work here added to the work done as part of conservation work being carried out by contractors as part of our Ways to Nature Project funded by the National Lottery Heritage Fund which has removed a lot of broom. An adjacent area has also been cleared by Bristol Parks as part of their regular winter works schedule. We were pleased to welcome two new faces to our first conservation work party of the New Year on a very cold, grey morning. We started by looking at the conservation work being carried out by contractors as part of our Ways to Nature Project funded by the National Lottery Heritage Fund - with Susan explaing reasons why that work and the work we do on these work parties is so important in managing the Hill for wildlife and in particular the invertebrates that live here. With a good turn out we were able to remove saplings and broom from a large area of the heathland. A small group also did a litter pick over the whole Hill, collecting various items including the remains from New Year fireworks. While any litter is frustrating we know that it is less of a problem on Troopers Hill than on some other sites in Bristol - thank you to everyone who takes their litter home and especially to those dog walkers and others who also regularly pick up other people's rubbish. Note - work activities now recorded against the new 2019 Management Plan. Before completing the work in compartment 4 that started in November, there were another couple of tasks to complete. First we excavated some channels to drain the puddles on the track alongside the Field and then we re-fixed the geology interpretation board near the chimney on a new backing board. 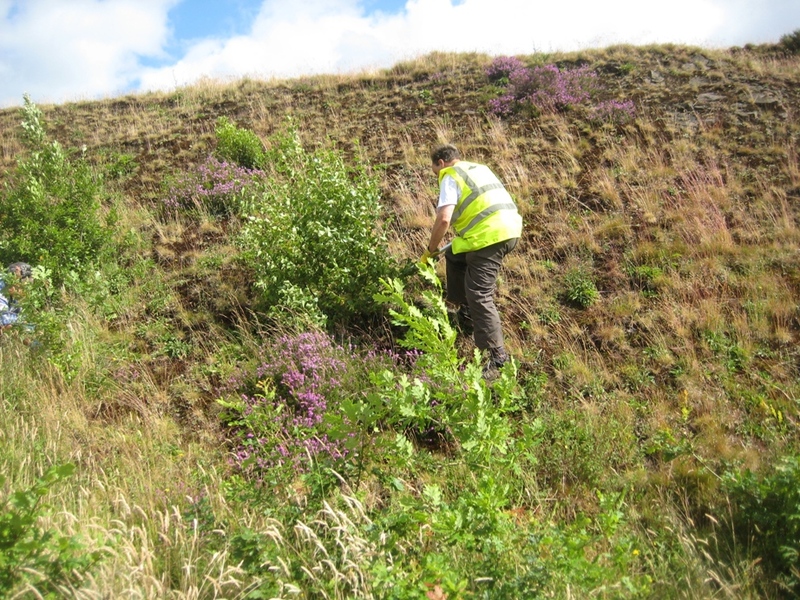 At the same time conservation work was being carried out by contractors further down the Hill (on the boundary of compartments 9 & 10) as part of our Ways to Nature Project funded by the Heritage Lottery Fund. This work included clearing bramble and young trees and unfortunately revealed a lot of litter that had built up over the years and had to be removed. The overnight rain cleared in time for us to be able to continue with this work party, although the ground was still very wet. We cleared bramble and some broom from the right-hand side of the path leading up from the lower chimney. As we worked we found some heather plants that had become completely over-shadowed by the broom illustrating that this area had recently been heathland and showing how this valuable habitat is being lost in some areas. We also uncovered some fungi. Today ParkWork focused on the scrub and bramble at the western end of compartment 4 adjacent to the path down from the chimney. On cloudy and mild but incresingly windy morning we were pleased that there was a larger than usual turnout for our first Saturday Conservation Work Party since August. We continued the work that we had started on the 18th October to remove bramble, saplings and some of the broom from the area above Sally's Glade. The aim is to stop the spread of the scrub and maximise the area of the acid grassland available for the bees - who we are sure would thank us if they could. Bring bonefire weekend we also did a litter pick, and came back to do another on Sunday morning, but most of the litter was already in the bins - thank you to everyoone who helps keep Troopers Hill clear of litter everyday, not just at our work parties. On a glorious sunny morning we were pleased to welcome two new volunteers to our workparty. One of the new faces was Emma Britton from BBC Radio Bristol who enthusiasticly got stuck in to cutting some bramble and also recorded some short interviews for her radio show. We were working in Sally's Glade clearing bramble and saplings but also some of the broom. In accordance with the Management Plan we want to preserve some areas of broom on the Hill but we have received advice that in this area it needs to be reduced to restore areas of grassland that have been lost in recent years. After a dry week a band of rain crossed Bristol at just the wrong time for us meaning that the work party had to be cancelled. The forecast rain held off to allow ParkWork and our volunteers to complete some excellent work removing low level bramble by strimmer and some sapplings with our loppers. We worked in two area, one below the chimney and the other in Sally's Glade. The Saturday Work Party in September had to be cancelled due to holidays and other commitments. Due to holidays, ParkWork weren't due to join us today and, as it turned out, they chose a good day to miss as early morning rain made it too wet for our planned conservation work. ParkWork had though paid us an extra visit during the previous week to strim some of the bracken at the end of the gully, where we had cleared it from the heather on 7th July. Eradicate Bracken or at least reduce it to a minimum apart from in scrub at boundaries. On a very hot and sunny morning we focused on bracken and cleared the area to the left of the steps up from the second entrance up Troopers Hill Road - the other side of the path to the area that ParkWork had cleared with their strimmer last month. Our efforts over the years have weakened the bracken here and there was alot of grass and heather amongst it, so clearing by hand rather than strimming meant these plants could be left to thrive. The bracken is now likely to start regrowing - this will weaken the rhizomes as at this time of year the plant would normally be storing energy for next year. Today the ParkWork team were busy with their strimmer, they returned to the area by the path to the lower chimney to again take out the regrowth of cherry saplings. They then cleared an area of bracken to the right of the steps leading up from the next entrance up Troopers Hill Rd. One of our number came from our friends next door, Street Goat. So she was set to cut invasive holm oaks, which can be eaten by goats, but not as 100% of their diet. The rest of us pulled and cut bracken, where it was invading into and choking the heather. Bristol Parks will visit with machinery soon to cut the larger stands of bracken, without damaging the heather. Where bramble was found this was cut and put into another bag for the goats. End result - 2 large bags of food for goats and an area of bracken prepared to machinery work can be done without damaging heather. By cutting and pulling the bracken its rhizomes will be weakened and we hope to eventually eradicate or at the very least, substantially reduce the amount of bracken, in line with the conservation management plan for the site. While the ParkWork team rebuilt some of the steps on the 'Doe' path down into the woodland from the Field, a small group of us cleared some saplings from the side of the gully. In the sunshine on the longest day of the year and with the heather coming into flower, Troopers Hill was looking fantastic - we saw the first marbled white butterflies of the year. Photographs of the morning here. A very warm morning saw a good turnout, including several new faces. From our meeting point at the top of the hill we walked down the path to first tackle some bramble in the grassland below the chimney. A second group then went further down the path to remove some saplings of oak, birch, sycamore and hawthorn from amongst the heather on the slopes above the nursery. Once the bramble had been removed the first group went on to remove some hawthorn saplings from the grassland at the very top of the Hill. The recent warm weather following on from a damp spring has led to some very strong grass growth this year, so it was often difficult to see the smaller saplings, or at times our volunteers. As on previous Saturday work parties the cuttings were taken to be fed to the goats in the adjacent allotments. ParkWork revisited the area cleared in November by the path to the lower chimney. Using their strimmer they removed the spring regrowth of bramble and cherry saplings. Once this was complete they did some more work on the steps. Footpath and step repair work. A morning clearing bramble and saplings from the edge of the broom areas above Sally's Glade. Some of the bramble was taken to be fed to the Streetgoat goats. TheParkWork team have certainly experienced extremes of weather on the Hill, today was very hot and sunny. Work included adding some stone fill to the steps above the nursery, enlarging the cage to one of the trees on the Field and a general litter pick. The overnight rain cleared away just in time for our start at 10am but the ground was still too wet and slippery for our planned conservation work. Instead we carried out a litter pick over the site and in the woodland. This included removal of 83 cans from one spot in the woodland. This month the ParkWork team tackled some of the gorse that was spreading into the heather. At the same time we removed some oak saplings. Prevent spread of gorse and begin cutting on a rotational plan to encourage regeneration, reduce the fire risk and prevent it becoming old and degenerate. Snow on 1st & 2nd March led to this work party being cancelled. Photos of the snow on 2nd March 2018 can be seen here. ParkWork couldn't join us for this session, so two of us took the opportunity to try out the use of the Council's battery hedge cutter to clear some bramble in Sally's Glade. It worked well and we may use it again to clear some areas where we want to remove bramble and take the arisings away. At the same time Bristol Parks were on site with their 'Scag' starting the winter works. On a cold morning we were very lucky to get a break in the rain. We returned to Sally's Glade to continue clearing bramble and saplings from the area above the path where there is a lot of broom. Given the weather we were surprised and pleased to have one of our largest groups for a while, many thanks to everyone. After the work party some of the holm oak we had cut at this and the previous work party was taken to feed the goats living in the adjacent allotments as part of the Street Goat Project. Photographs of the morning here (and of a goat being fed). Another sunny morning with the ParkWork team. We split into two groups with one removing holm oak saplings in the area between the path and the allotment fence and the other clearing the steps in the middle of the hill. A very cold cloudy morning was not very inspiring for our first work party of 2018. We carried out a litter pick and a sapling hunt focusing on the northern part of the site. The hot coffee was very welcome afterwards. Due to Christmas, ParkWork were unable to join us for this session. A small group did a litter pick on the hill and in the woodland. We also removed some ivy from an oak tree near Greendown, the extent of the ivy was causing a risk of branches being broken off in strong winds. The early morning drizzle cleared to leave a dry but cold morning. We continued the work started by ParkWork last month, clearing bramble and a lot of saplings. After two wet sessions the sun shone on the ParkWork team this morning as they worked to clear scrub & saplings from the right of the path up from the lower chimney, of particular concern in this area are the number of cherry saplings. As a trial ParkWork used a hedge cutter to clear the bramble which was very successful. After being rained off in October, we returned to complete the work near Sally's Glade that we started in September. We removed a lot of birch, oak and hawthorn saplings as well as bramble as we continue to try and prevent the spread of woodland and scrub into the heathland. Two of our group also cleared the remains of some of the fireworks that had been let off on the hill last night. We also cut down a dead ash tree on Troopers Hill Field and cleared litter from the play area. Another wet morning but, with help from two of our volunteers, the ParkWork team worked through the rain to clear an area of scrub & saplings below the chimney. There was a mixture of broom, birch & oak together with a lot of bramble to clear to return this area to grassland. Wet weather meant that our planned scrub clearance couldn't go ahead because the ground was too slippery. We did a short litter pick and were hoping the rain would clear but soon gave up - partly because there wasn't much litter! A big thank you to all the dog walkers and others who help keep Troopers Hill clean & tidy. On a wet morning ParkWork carried out some pruning of a goat willow over hanging one of the paths. They then returned as the weather improved in the afternoon to start tidying up the entrance at Greendown by removing the log retaining structure installed some years ago which is now no longer required. Cut back vegetation adjacent to and overhanging footpaths and entrances. On a warm sunny morning we removed a lot of silver birch and some holm oak saplings from the area around the path down to the western side of Sally's Glade. We also removed a branch from the goat willow that had cracked and cleared up the area at the base of the tree where there had been a small fire. Afterwards we enjoyed the banana cake we were given with our coffee. 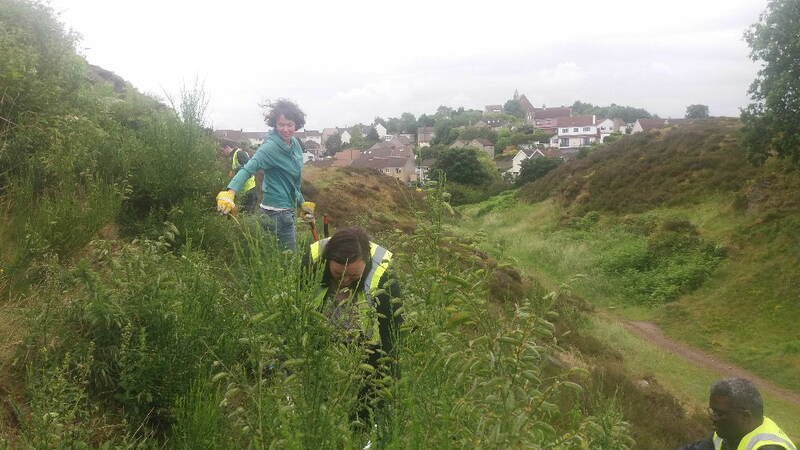 For this ParkWork visit we cleared some saplings and broom from the heather area to the south of the gully. From this point it is a long drag to dispose of the cuttings, so it is an area we have been reluctant to tackle on our Saturday Work Parties. The team finished the morning by tidying up some broken branches and removing epicormic growth on the trees on Troopers Hill Field. We were lucky to avoid most of the showers and were pleased to welcome some first timers in some summer sunshine. 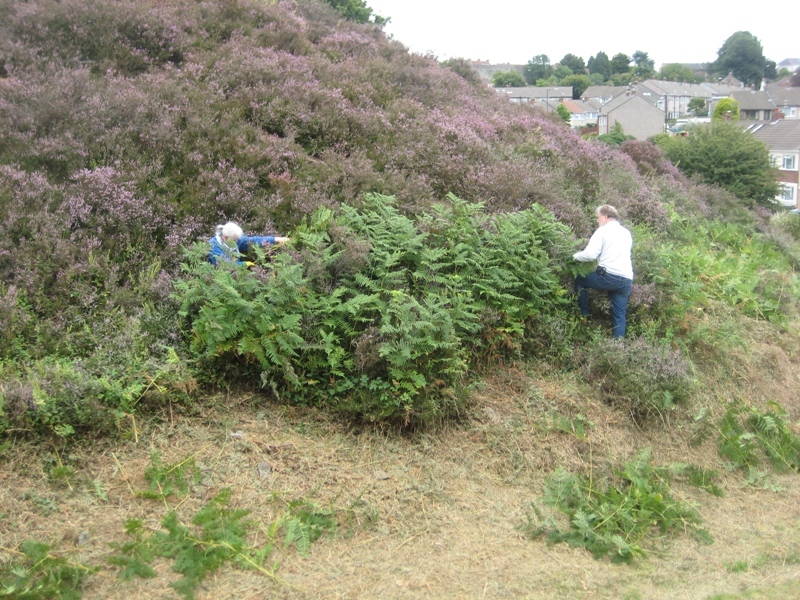 The main task was to clear bracken from amongst the heather at the edges of an area at the end of the gully where Bristol Parks had strimmed a large area of bracken earlier in the week. Cutting the bracken at this time of year weakens it as it has to regrow rather than taking in energy to store for next year. Once the area was clear, we moved on up the gully removing saplings and bramble so that they do not gow and over-shadow the heather - which was looking at its best in the sunshine. We also picked up litter, mostly plastic bottles that had been thrown over the edge of the gully. The bracken, saplings & bramble were taken in large bags to the gate at Greendown for Bristol Parks to remove later in the week. This was a great example of how we are able to work with Bristol Parks to maintain the site. We hope that this partnership working will continue in future years, but this is under threat due to the impact of Government cuts on the Council's budget. Please sign the Bristol Parks Forum petition against these cuts here. On the second of our regular visits from ParkWork the focus was on continuing the work started on 1st July to clear broom in the area above Sally's Glade and the path down towards the woods. A small group worked in the area above Sally's Glade clearing the regrowth of broom from an area where a lot of broom was removed last year folowing advice that this is now spreading too far up the hill. This was the first of what will be regular work parties on Thursdays as part of a new project where ParkWork are working in green spaces across St George and anyone is welcome to volunteer to join them. We focused on clearing some broom in the gully where it has been spreading and displacing the heather. While we aim to protect broom from being overcome by bramble on some parts of the hill, we also need to control its spread elsewhere. This is a good time of year to remove it as we have had the benefit of seeing the yellow flowers but it is before the seed pods mature, so it prevents further spread. Something new for us this month, a group of friends decided that joining us for a work party on the hill would be a good way to start a Hen Weekend to celebrate Maria's forthcoming wedding. Eleven of them joined us and helped clear some gorse where is was spreading into the heathland. Meanwhile we also cleared some saplings from the top end of the gully and cut back some broom where it was starting to obstruct the paths. The coffee, tea & biscuits near the chimney afterwards by the chimney were very welcome. Photographs of the morning here. 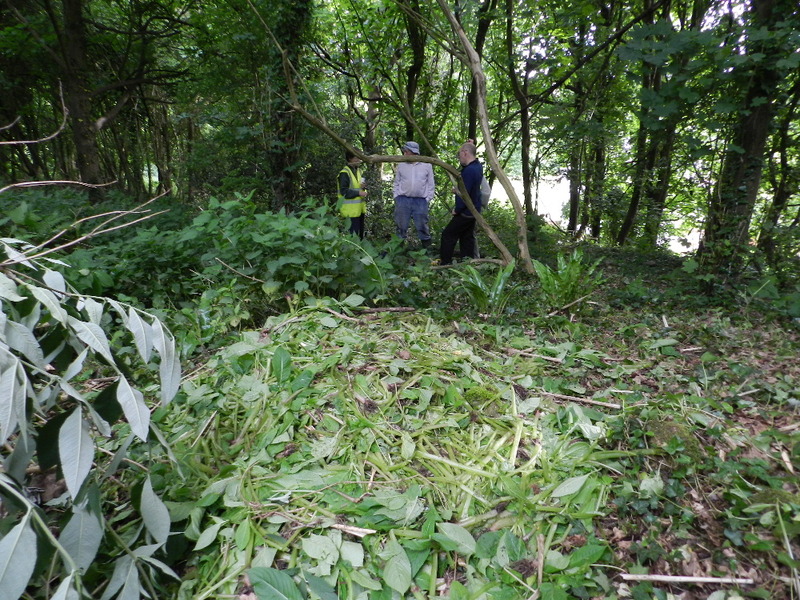 The invasive weed, Himalayan Balsam, had been found in Troopers Hill Woodland, so we organised an additional work party to remove the plants & stop them spreading. Himalayan Balsam is an annual, so by pulling the plants before they get chance to seed you can prevent the spread and reduce the number that will grow the following year. As the seeds are only viable for 18 months it is possible to eradicate the weed in two years, provided there is nowhere else nearby that the seeds can come from. Two hours work cleared all that we could see in this part of the woodland. Thank you to whoever it was who had got there before us to clear an adjacent area. Photographs of the afternoon here. On a cloudy morning with a strong breeze, we continued last month's work clearing bramble and saplings for the areas of heather in the gully. 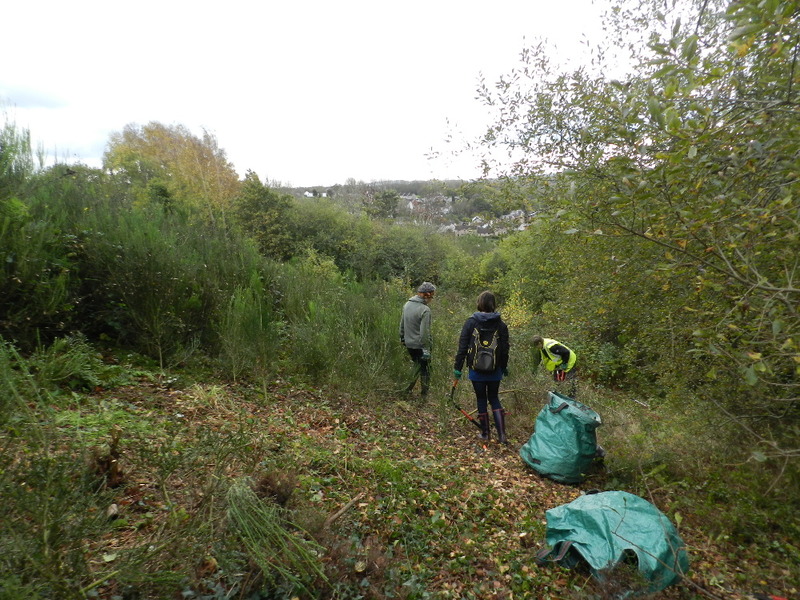 Two volunteers, who have been trained by Bristol Parks, were also busy with a strimmer clearing low lying bramble in Sally's Glade having first cleared the steps from the Field into the Woodland. We avoided the April showers and enjoyed some warm sunshine as we cleared bramble and saplings from the area near the entrance to the gully. At the same time our chair, who has been trained by Bristol Parks to use a strimmer, was busy clearing low lying bramble in Sally's Glade. On a sunny Spring morning, after a wet Friday, we tackled two separate areas. First we removed some bramble and saplings, including some holm oaks from the area near where the route of the duct from the chimney meets the path. The second area was some broom that was spreading into the grassland near the old mineshaft. As it was the weekend of the #BristolSpringClean, we also carried out a litter pick, sadly we also had to clear a lot of dog mess from the area where we were working. Bizarrely, we also found some rice that had been tipped on Troopers Hill Field. Afterwards we were able to sit in the sunshine and enjoy our coffee and biscuits. On a dry morning with some sunshine we tackled an area that had been listed as a priority in last year's Photo Survey. This was an area above the nursery where broom and bramble were invading an area of heather. Community Payback had done some work on this area in October but it took 8 of us a good 2 hours of work to clear the remaining broom and bramble, including carrying the cuttings away. A misty morning, but not as cold as the previous two days. We cleared some broom and gorse from the heather around the eroded area on the south facing slopes of the hill. We also took down some saplings at the edge of the heather. This work had been indentified as a priority in the report on last year's Photo Survey. There were four 'first timers' on this work party - it is good to see more people joining us to help maintain this important site. On another cold morning (though not as cold as earlier in the week) we continued the work to clear broom and bramble above Sally's Glade. It was good to see some new faces. For the first time we also did some work with a strimmer lent by Bristol Parks after two of our members went on a training course earlier in the year. Having tried this out we have decided in future that this is done on separate days so that at work parties we can all work together. A cold but sunny morning found us working in the area above Sally's Glade continuing from the great start made by Community Payback last month. As well as clearing bramble and saplings we also removed some of the broom, folowing advice that this is now spreading too far up the hill. Being bonfire weekend we also carried out a litter pick over the hill to pick up some of the remnants of the night before. Two of us then did another litter pick on the Sunday morning and collected four bags of firework remains and other litter left on Saturday night. We were very lucky to get a break in the showers which allowed us to remove some saplings and bramble from the northern corner of compartment 9. Part of the area we were clearing is where the red & white fungi 'fly agaric' has grown in recent years, so we hope it will appear later in the month. At the same time Community Payback were busy removing some of the broom and bramble that is spreading and starting to displace the heatther further down in compartment 9 on the slopes above the nursery. We are very pleased to have payback working on the Hill again, this visit (2 days theis weekend and 2 days next weekend) has been organised by the St George Neighbourhood Partnership . Rain was forecast 'from lunchtime' but unfortunately it arrived early ahead of what became a very wet afternoon. However, a good turnout meant that we were able to achieve most of what we set out to do before we had to curtail the work party just after 11am. We removed the bracken from the edge of the heather at the end of the gully after Bristol Parks had strimmed most of it the week before. We were also able to remove some oak saplings growing in the grassland. A warm and sunny morning with the heather looking at its best. We worked on the slope above the nursery clearing saplings and also removing some broom. While is is important to protect areas of broom on the hill, we also need to control its spread so that it doesn't take over areas of heathland and reduce the area of heather and grassland which are important for the many invertebrates living on the hill. As we enjoyed our coffee after the work a buzard settled in the one of the trees and watched us for a while. Later in the month we had an impromptu evening work party to remove some Himalayan Balsam that had been spotted on the Hill. After disappointing weather in June we were pleased to have a warm summer afternoon for the second of our afternoon work parties for this year. We completed the clearance of the bracken where it was encroaching into the heather in the area we worked on at the last work party - and then also cleared some saplings and bramble from the area of heathland to the left of the steps. We were particularly pleased to be joined by some of the Street Goat team, who were able to take some of the bramble and saplings we had cut to help feed the goats. 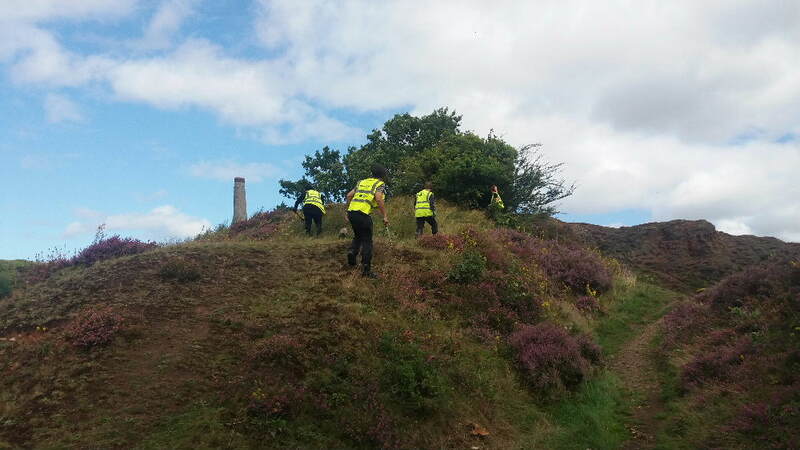 A small group cleared some of the bracken from amongst the broom at the top of the steps up from Troopers Hill Road. This was an area where Bristol Parks had cleared a large area of bracken with strimmers last month. Cutting the bracken at this time of year weakens it as it has to regrow rather than taking in energy to store for next year. Unfortunately the weather let us down on the first of our two summer Sunday afternoon work parties for this year. With the ground already wet and more rain forecast we abandoned our plans to cut bracken and instead did a litter pick over the Hill and some of the woodland. We were pleased to find that there was in fact very little litter - a big thank you to all those local dog walkers and other who regularly pick up litter as they walk round. A warm but cloudy morning. A change of scene this month as we moved to the area next to the path leading from the lower chimney to remove some bramble and also some cherry tree saplings. We were pleased to see Bristol Parks busy cutting the grass in Troopers Hill Field. They have also started work to strim the large areas of bracken so that we can remove it where it is growing amongst the heather later in the month on our Sunday afternoon work party (19th June). More work in Sally's Galade on one of the first really warm days of the year. After a grey start the sun came out as we continued the work in Sally's Glade that we started last month. As well as clearing bramble from the broom, we also removed some holm oak saplings. The early morning drizzle cleared to give a grey morning with occasional glimpses of sunshine, though with a very cold wind. We were pleased to be able to get a full two hours done without any rain for the first time this year. Our work focused on removing bramble from the broom at the edge of Sally's Glade. We also put up a new 'Welcome to Troopers Hill' flag to repace the Bristol Green Capital 2015 flag that had become rather tatty. A very wet & windy morning meant that we had to cancel the Saturday morning work party on 6th February. Unfortunately it was also wet on the afternoon of 21st February when we had hoped to run the first of three Sunday Conservation Work Parties this year. A break in the morning showers allowed us to do some work removing brambles and saplings in Sally's Glade. Good progress was made despite the showers causing an early finish. With the rain from storm 'Desmond' staying well north of us it was a dry but windy morning. We concentrated on the gorse that was spreading into the heather and saplings in the area of broom at the top of the steps from Troopers Hill Road. This was where Bristol Parks and Community Payback had done some work to clear a large area of bramble and gorse as the first phase of the winter works. As shown on facebook here. Due to the wet & windy weather our planned conservation work party on 7th November was cancelled. One of our tasks for the morning would have been a litter pick to deal with any remains of fireworks, but we could see on Friday that thanks to dog walkers and other Hill visitors there was going to e very few to pick up. A BIG thank you to everyone who helps keep the Hill looking good throughout the year. A misty morning after a dry and sunny week. We continued to work in the area we started last month, with two people also clearing bramble for around a silver birch to clear an area where fly agaric often appear at this time of year. We hope it will put on a good show for our Fungi Foray on 1st November. A good turn out today, with two new faces. We started to remove the bracken & bramble in the area above the steps leading from entrance E on Troopers Hill Road and also removed some gorse from the adjacent area of heather. A very enjoyable Sunday afternoon where we were joined by lots of young helpers to clear some bracken from beside the steps leading up from Troopers Hill Road. 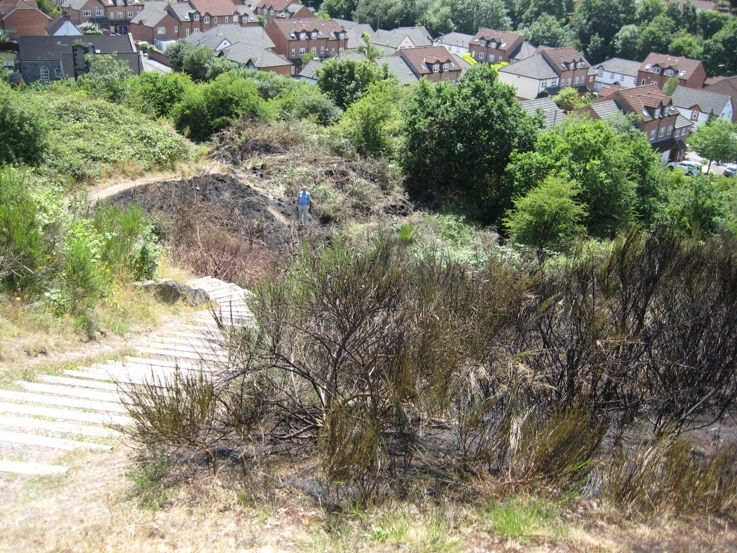 Bristol Parks had cleared the area to the right of the steps so we were able to complete the job by clearing the other side where the bracken was growing amongst heather and therefore needed clearing by hand. A small group met to clear bracken where it is spreading into the heather at the end of the gully. Bristol Parks had strimmed the large areas of bracken here during the previous week so that we were able to concentrate on areas where it need to be pulled or cut by hand since attempting to strim it would also damage the heather. We also removed saplings from the area. Cutting bracken in the summer causes it to regrow at a time when it should be collecting energy by photosynthesis. This weakens the root stock and if repeated over several years will eventally kill off the bracken. Areas of bracken have a much lower biodiversity than the important heathland and grassland habitats on the Hill that we are aiming to protect and the Management Plan has eradication of bracken as one of its aims. This was the first of two Sunday afternoon work parties planned this year. Despite a low turn out on a warm sunny afternoon, we were able to clear a significant number of saplings from the grassland near Sally's Glade. A warm summer morning though with some cloud giving welcome breaks from the direct sun. We focused on clearing saplings from the north side of the gully in two areas. Many of these were small holm oaks which are a particular problem as they are evergreen. Removing these saplings ensures that the heather and acid grassland is able to thrive and provide home and food sources for the many bees and other invertebrates that live on the Hill. While we were working a bee survey was being carried out as part of a Natural History Museum led project. We also removed some low branches that were overhanging a path on the other side of the Hill. More about the day on our facebook page. As a change from our usual battle with bramble and saplings the task for part of the group this morning was to remove grass from the edge of the wheelchair path leading to the chimney. This was in part to investigate the condition of the path edges and establish whether the edges of the whole path should be cleared. Update: Following our initial work on the path edges we were able to arrange through the Neighbourhood Partnership and Bristol Parks to get the rest of the path completed by offenders on the Community Payback scheme on 29th & 30th August. Maintain path in a suitable condition for use by wheelchairs and pushchairs. A spring morning with the broom in flower found us working in Sally's Glade clearing bramble and holm oak saplings. It was good to welcome two new recruits on a cold cloudy morning, which had started for some of us with a Dawn Chorus Walk at St George Park, part of a series of walks Exploring St George's Green Spaces. We fouused on the area of broom above the steps leading up from Trooopers Hill Road (entrance E) and cleared a lot of bramble and a few saplings that were threatening to overwhelm it. 2 Photographs of the morning here. Friends of Troopers Hill had to split our resources this morning with some of us running our stand at St George Community Fair, so we were pleased to welcome extra help from a group of young people taking part in the National Citizen Service (NCS) Action Day. A glorious sunny spring morning saw us split into two groups both working in the area above the nursery. 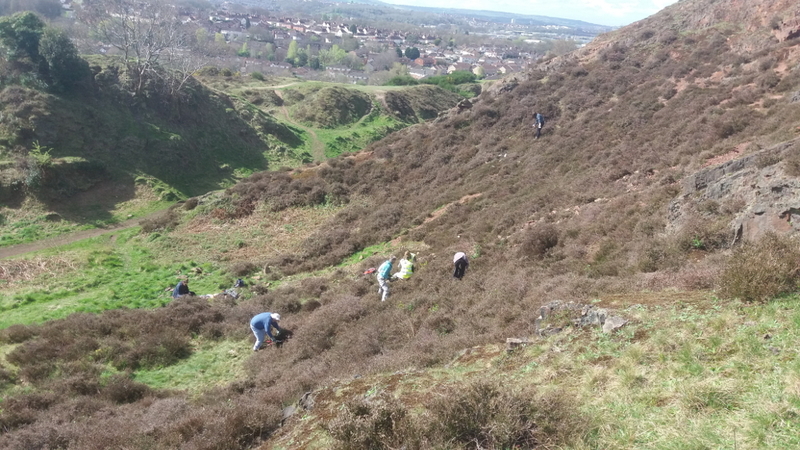 While one group cleared some of the broom from the more gentle slopes to prevent it taking over completly from the heather, the others were clearing holm oak and other scrub & saplings from the steeper slopes. A cold and frosty morning found us working near Sally's Glade clearing bramble and a lot of holm oak saplings. Holm oak are evergreen oaks which are native to the Mediterranean area are a particular problem because they over shadow other species. One of the aims of the Management Plan is to eradicate them from the site, in the winter they are easy to spot. A very windy morning, but we avoided the showers and it was good to see several new faces. We again worked on clearing bramble and saplings from the area to the right of the path up from the lower chimney. For our last work party of 2014, we continued to work in the area we started last month clearing bramble and saplings in glorious sunshine. A very mild morning for November with sunshine making it seem more like spring than autumn, especially since there were yellow flowers on some of the broom. We cleared bramble and saplings from the area to the right of the path up from the lower chimney. Meantime Community Payback were clearing some more of the gorse in compartment 5. Due to the rain and very wet ground we decided we had to cancel this month's work party. Frustratingly the rain then cleared to give a bright and sunny afternoon. Thank you to 17 volunteers from Lloyds Bank who gave their time to help make a difference on Troopers Hill Local Nature Reserve. A full report and photographs can be seen here. We have spent many hours on work parties cutting back bramble to allow areas of broom scrub to thrive on the Hill, however, there are some areas where we need to control the spread of broom into the heathland. An example of this is in the gully and so on a morning that started with light rain we cleared most of a large patch of broom that had grown on the south facing side of the gully over the last couple of years. The broom is much easier to cut than bramble, so we found we had more cuttings than we thought we we came to gather it all together. We had to do a bit of overtime to collect all the cuttings and drag them to the gate at Greendown for Bristol Parks to collect. A cooler evening but having cleared another 100+ small saplings of mostly oak, hawthorn and holm oak from the gully (and done a quick litter pick) we enjoyed some wine sitting on top of the Hill watching a magnificent sunset. With rain falling at 10am and the ground very wet, a small group of us spent the morning in a garage cleaning and sharpening our loppers ready for future work parties. A very warm evening after a hot summer's day, fortunately the evening storms missed us. A small group cleared tree saplings from an area in the gully before relaxing in the area we had cleared with a couple of bottles of wine. The early morning light rain had mostly cleared by the time we started and by 11am it was very hot in the sunshine. We split into two groups with the larger group tackling bracken where it is is spreading into areas of heather both at the end of the gully and above the steps from entrance E. The larger areas of bracken are strimmed by our Park Keeper. Cutting bracken at this time of year means that it regrows and this weakens the roots tubers resulting in less vigorous growth next year. This group also removed gorse where it had appeared amongst the heather on the south facing slopes, without contol the gorse and bracken would spread and shade out the heather. Meantime three of us pruned the hedge and tidied the raised bed at entrance C. This hedge has grown very well this year so that the view of the entrance had been obscured from the road and the entrance path was overshadowed. Both groups came together for well earned coffee & biscuits after the session. Maintain raised bed at entrance C for road safety to prevent pedestrians crossing close to junction of Greendown and Troopers Hill Road. The forecast thunderstorms mostly missed St George this morning but the ground was wet and slippery after overnight rain, so instead of our planned attack on the bracken a small group walked over the Hill clearing saplings from some of the flater areas of grassland. A huge thank you to 10 volunteers from Lloyds Bank who came to Troopers Hill for a volunteer work day on Thursday 22nd May. We continued the work we started last month in Sally's Glade. Cloudy but only one light shower as we cleared some of the bramble and saplings from Sally's Glade. As we were finishing Good Gym Bristol arrived to give us a helping hand, so we were able to hand over our tools to them and watch them work as we had our well earned coffee and biscuits. After all the rain and wind of the last three months it was wonderful to be out on the hill in some spring sunshine. While two people did some pruning of the hedge at the Greendown entrance the others followed the path parallel to Troopers Hill Rd taking out saplings and bramble from the heather and broom on the side of the path away from the road. Most of the work was concentrated in the area about the steps up from entrance E. The cuttings were left in two yellow bags for our park keeper to take away later in the week. With the work finished we sat in the sun enjoying our coffee and biscuits. With very wet ground and showers forecast we canceled this month's work party. In fact the showers failed to materialise, though there was a very cold wind, so a small group of us did a litter pick and also cleared some drainage channels to try and reduce the amount of mud on some of the paths. Due to the rain and very wet ground we decided we had to cancel this month's work party. As we assembled on a relatively mild morning, we were pleased to see balloons tied to the gate at our meeting point to mark 10 years since Friends of Troopers Hill was formed in December 2003. Our task today was to complete the clearance of bramble and saplings from the area that we started on last month. Having completed this area there was a real sense of achievement as we sat down for well earned coffee and biscuits. A breezy morning but only a couple of light showers so we were able to clear a lot of bramble and saplings from the area of broom to the left of the path up from the lower chimney. On a mild autumn morning with dry weather after a wet week we continued working in the areas that we started last month. While much of our work has been aimed at maintaining areas of broom scrub and preventing it from being over run by bramble; there are some areas of the Hill where we need to control the spread of broom into the heathland. It was one of these areas that we tackled at this mornings work party in compartment 8. The broom, bramble and saplings that we removed were placed in large bags for collection later by Bristol Parks. We also removed some saplings from the slopes above the nursery in compartment 9. This work had been started by girls from Badminton School earlier in the week. On a sunny morning we started by putting up our new Green Flag, this followed the presentation of the 2013/14 award earlier in the week. You can read more on our Green Flag Page. 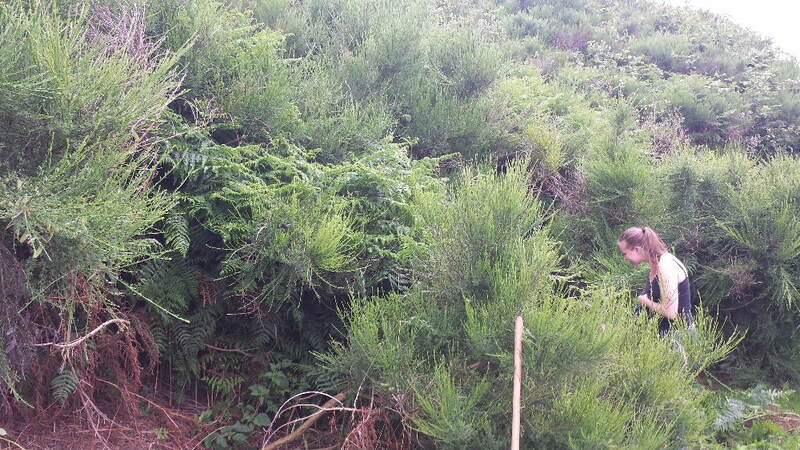 The main work focused on the areas of bracken at the Troopers Hill Rd end of the Gully. We cleared the bracken from the heather at the edges of the bracken patch, so that our 'Parkie' can follow up by strimming the main patch. We also cut several saplings and some bramble from the heather and bagged them up for Bristol Parks to collect. Two of our group also cleared the path edges on some of the paths through the woods. A planned evening work party on 14th August was cancelled due to wet weather. A very warm evening after a hot summers day. A small group cleared tree saplings from an area in the gully before relaxing on top of the Hill with a couple of bottles of wine. More work in Sally's Glade on a very hot and sunny day. For the first time for a long time we had to retreat to the more shaded areas. Back to Sally's Glade on a glorious warm sunny morning. Troopers Hill was looking at its best with the broom and hawthorn in full flower. We cleared a lot of bramble and saplings to help preserve this wonderful glade that is so important for the invertebrates that live on the Hill. Our regular May session in Sally's Glade clearing some of the bramble and saplings. The cold spring has delayed the broom from coming into flower this year but it was good to see that it is now coming out. After a very cold month it was relatively warm in the sunshine. We were again working along the path from the lower chimney, though avoiding the denser areas of scrub because of the possibility of nesting birds. We also cleared some rubbish from the bottom of the slope down to the nursery. We were again pleased to welcome Good Gym Bristol to give us a boost towards the end of the session. 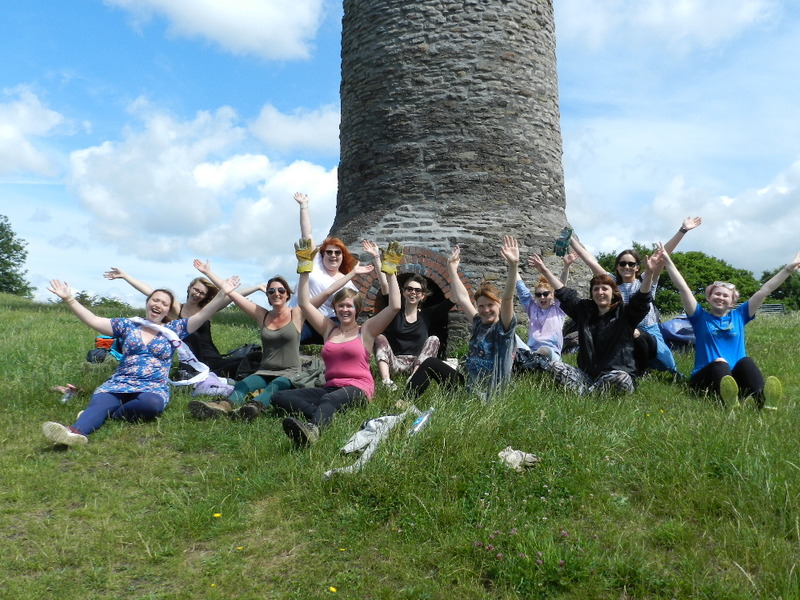 As we were drinking coffee and eating biscuits after the hard work, the Good Gym members ran to the top of the Hill to look at the chimney before running back to their meeting point at Temple Meads. Back in the area we visited last month, we cleared some more bramble and from the other side of the path we removed a holm oak. At the same time a small group did a litter pick over the Hill and through the woods. While we were working away a group from Good Gym Bristol ran to Troopers Hill from Temple Meads and then joined in to give us an extra boost or the last half hour or so. They cleared some bramble and cherry saplings from the right of the path. The Good Gym team also moved some cut broom from the slopes above the nursery. This had been cut earlier in the week by the Woodland and Wildlife team from the Council, a task that they will continue this week. While we were finishing our coffee and biscuits, the Good Gym gang ran off up the Hill to return to the centre of Bristol; a big thank you to them for their help. A sunny morning on Troopers Hill. The area in Compartment 9 (left of the steps leading up from the square chimney) has recovered well from the fire there in July 2010. Our Community Park Keeper did a lot of strimming of bramble there last week which allowed the volunteers to follow up his good work and get in amongst the new grown broom to cut out bramble and saplings. A cloudy but mild and dry morning and a relatively dry week had allowed the ground to dry out a bit so it was ideal conditions for continuing the work we started last month in Sally's Glade. We were especially pleased to welcome three 'first timers'. A couple of photographs of the morning here. On a sunny but frosty morning we were pleased to see as we assembled at Greendown that Bristol Parks had cut the hedge that we planted in January 2006. In previous years we have pruned the hedge at work parties but it has now reached a size where mechanical cutting is needed. There were fantastic views from the top of the Hill as we walked over to Sally's Glade to clear some bramble and saplings. Our work here has been helped by a visit from Community Payback a couple of weeks before as part of our Stepping Forward Project. Their work included cutting some paths through the broom, this enabled us to get to some of the saplings in the middle of the area and will also act as firebreaks. The work meant removing some of the broom, but this was necessary to enable the rest of the broom to be protected. We were very lucky with the weather, the forecast showers all missed Bristol. This was a work party of two parts, first we cleared some more gorse in the area we worked on last month. Then we moved to remove some bramble and saplings near the 'Goat Willow' waymarker. The morning's activities were videoed by some second year students on a degree course at UWE. A glorious sunny October morning - the chocolate biscuits melted! The morning's work focused on the gorse near the centre of the Hill. A large area of gorse was cleared by Community Payback in March and this is now regenerating well. Our task today was to remove new gorse plants (and one or two older ones that were left in March) that were growing around the edge of this area in the heather of the heathland. The cut gorse was bagged and stacked to be removed by Bristol Parks on Monday. Ideal weather, dry with some bursts of sunshine. 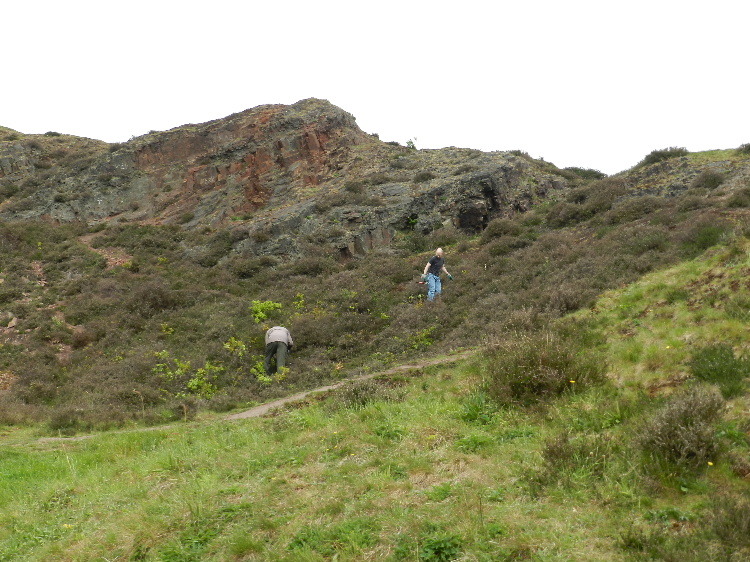 We continued the work in the broom above Sally's Glade and also removed some saplings from the grassland nearby. As we worked buzzards were circling overhead making their distinctive calls. Given that this has been a very wet summer we were very lucky to have another dry and sunny evening for our second evening work party. We cleared a lot of bramble and saplings (silver birch, oak & hawthorn) from the area of broom above Sally's Glade. Once the tools were put away we enjoyed a chat and a few glasses of wine or beer. Photographs of the evening here. We were fortunate to miss the showers and even to have some sunshine. Work focused on the gully, removing saplings and bracken from the areas of heathland. At the same time 'Trail Markers' were being installed in the woodland on 4th August by offenders on the ‘Community Payback’ scheme as part of our Stepping Forward Project. Three tasks for a very warm and sunny evening. First we put up our new Green Flag. Next we cleared some bracken from the heather at the entrance to the gully. This will allow our 'Parkie' Julian to avoid the heather when he next strims the bracken. Lastly, having put the tools away we enjoyed some beer and wine sitting in the evening sunshine near the top of the Hill. Due to the very wet weather we had to cancel July's Saturday work party, but don't forget there is an evening work party planned on Wed 25th July at 7pm. Saturday of the Jubilee weekend saw us attacking the bracken at the top of the steps from entrance E. This is an area where the broom is doing very well after past efforts to clear bramble and bracken. We cleared the bracken from around the broom, leaving the larger areas for Jules, our park keeper, to strim next week. This work party was just at the right time – the bracken had grown quickly and plants underneath were still alive, like heath bedstraw, heather, broom and the the grasses that help make Troopers Hill so special. Photographs of the day here. A smaller group than usual due to some of our regulars being on holiday (including Susan - whose coffee and tea making skills were sadly missed). With the broom giving a good show of its yellow flowers we were back in Sally's Glade clearing some of the bramble. We were pleased to welcome volunteers from from the Biodiversity team at DEFRA who helped cut some saplings that were growing in the grassland and heathland. We also gave them a brief tour of the hill and talked about the site's history during a well deserved lunch break. A full report can be seen here. A cloudy but dry morning found us working at the west end of Sally's Glade. This is the area where the Community Payback team did some work last month. There are some wonderfully shaped willow trees here, but around them lots of saplings had grown and were spreading into the broom along with bramble. Our aim is to let the broom establish itself in this area. Some early spring sunshine after some overnight rain and we were lucky enough to avoid the showers with the hail arriving just after we had enjoyed our coffee and biscuits. We were pleased to welcome two new faces as we cleared bramble and saplings from the slope above the steps from entrance E. This is an area where broom is re-establishing itself after we have removed a lot of bramble over the last few years. The cuttings will be removed during the week using the gate that the payback team fitted last month. At the same time a team of offenders on the ‘Community Payback’ scheme were clearing saplings and bamble from the west end of Sally's Glade near the top of the steps down into the woodland. This work is funded by the Big Lottery as pert of our Stepping Forward Project. Over the next two days the team will be removing some of the gorse above entrance E.
After a very cold week, we were lucky to get this work party completed before the afternoon snow arrived. 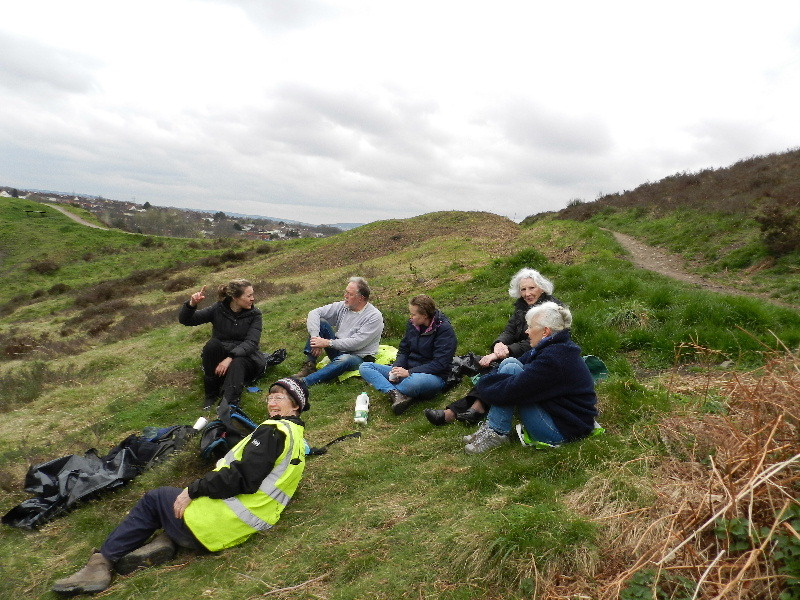 We cleared bramble and saplings from the edge of the heathland near Greendown. At the same time one of our members did a litter pick over the hill - as she does regularly between work parties. While we were working near Greendown a team of offenders on the ‘Community Payback’ scheme installed a new gate post at the second entrance up the hill on Troopers Hill Rd. This gate will allow our park keeper easier access with tools and will also make it easier to remove cut bramble etc from the hill. This work is funded by the Big Lottery as pert of our Stepping Forward Project. After storms during the week, we were pleased to have a sunny spring like morning to prune the Greendown hedge that we planted in January 2006. There was a good turnout and we produced many more cuttings than last year for Bristol Parks to collect later in the week. One of our members also carried out a litter pick over the hill. Maintain recently planted hedgerow through weeding, mulching and pruning. A 'nice sunny morn' after a wet night. It was also mild, even feeling warm in the sunshine - a complete contrast to this time last year. We returned to complete the work we started last month, with a particular focus being the removal of some cherry saplings. After a wet couple of days it was good to see a dry and bright morning, it was also very mild. Today we tackled bramble and saplings in the area above the lower chimney that got burnt in Spriing 2010. There are a lot of new broom plants growing here and we hope to keep the bramble at bay to give them a chance to establish. A litter pick by a couple of the group found surprisingly few firework remains, but unfortunately we did recover the molten remains of another wheelie-bin. Bright sunshine on the warmest Saturday morning for a work party of the year had at least one of our regulars wishing for cloud and drizzle. We again spent the morning in Sally's Glade with two of our members completing a litter pick concentrating on Troopers Hill Field. The well deserved coffee and biscuits was taken sitting in the shade, where we found a lot of different fungi. Another morning working in Sally's Glade clearing bramble. We were very pleased to see two more new faces. 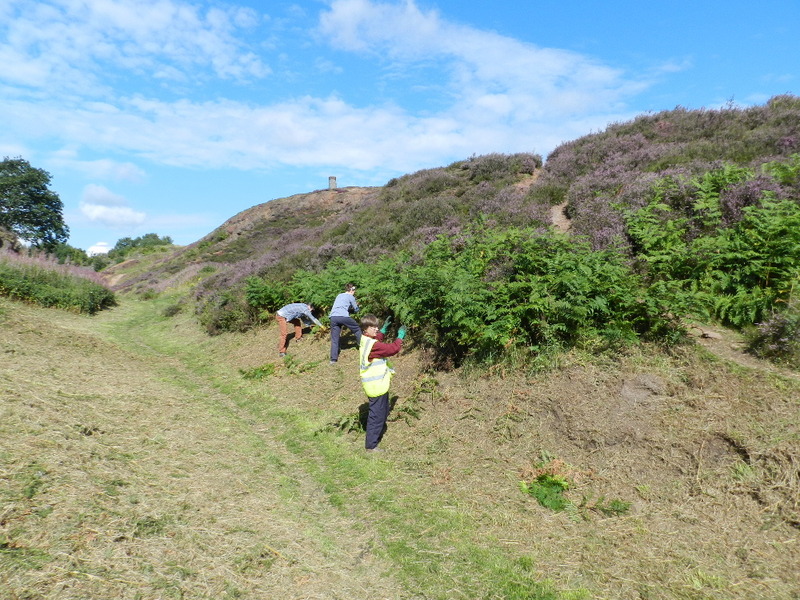 We also cleared some isolated gorse that had appeared in the main area of bell heather on the south facing slopes and a small amount of litter from the top of the hill. During coffee and biscuits we presented Oscar with a card for his tenth birthday and a certificate to thank him for completing 25 hours of work for us on Saturday mornings. A cloudy morning but dry apart from the occasional spot of rain. We continued the work in Sally's Glade that we were doing last month and also cleared saplings from the grassland area to the east of the glade. This is an area where trees were cleared in 2007 to recover an area of lost grassland. At the end of the session and prior to our well earned coffee and biscuits we put up our new Green Flag and posed for photos showing our '5 in a row'. A hot sunny morning in Sally's Glade with the shaded areas being the most popular spaces to work. We cleared a lot of hawthorn saplings and low lying bramble. Two of the group also went on a sapling hunt in the grassland over the top of the hill. The weather was very sunny for the majority of the work party, an excellent start for the two new members. We cleared saplings and bramble from Sally's Glade which will allow the broom to spread and grow. Meanwhile two of the party were clearing bracken and brambles at the top of the steps which lead from Troopers Hill Road. The showers began at 11.45 which signalled the end of the work party, however we spent the last few minutes tidying up and disposing of waste, this was followed by a well earned cup of tea on the flat section by the Green Flag. Following the loss of the work party on 7th May we agreed at our meeting that week to try an evening work party. Unfortunately the weather again wasn't great but the showers cleared so 8 of our regulars braved the wind and cleared some saplings from various parts of the hill. Afterwards we relaxed in a sheltered hollow with a couple of glasses of wine. After over a month of almost unbroken dry weather in one of the driest springs on record, heavy rain on Saturday morning meant that unfortunately this work party had to be cancelled. The morning showers cleared in time for a small group to clear some scrub from the side of Sally's Glade. There are lots of green shoots but but with the sapplings not yet fully in leaf we were able to ensure that we did not disturb and nesting birds. We also completed a litter pick through the gully but had to leave the burnt remains of a wheelie bin for our park-keeper to remove next week. Our thanks to the residents that called the fire service and prevented this fire from spreading further. After a satisfying morning's exercise we then spent the afternoon running a consultation session for our 'Stepping Forward' project - see www.troopers-hill.org.uk/steppingforward. A dry morning with the occasional glimpse of the sun but a cold wind. With the dry ground we were able to work on the steep slopes above the steps from entrance E where the rain prevented us from working last month. A few years ago the bramble on these slopes had choked the broom but since we started regularly clearing the bramble the broom has regenerated. We also removed bramble from the grassland around the area to the west of here leaving the thicker bramble to be cleared by our 'parkie'. Meanwhile two of the group cut some large saplings in the area of bracken towards the bottom of the slope and tackled bramble in another area of broom. The coffee and biscuits afterwards were very welcome! A very blustery and showery day with the ground being very wet after overnight rain. The slippery ground conditions meant that we had to change our plans and work in a relatively flat area; so we cut back some of the bramble from the 'ant hill' area at the top of the hill between the path and the allotment fence. While litter picking near this area we found a handbag which had been thrown in the bushes. We later discovered that it had been stolen during the previous week and were pleased to be able to return it and the photo that was inside to its owner. The hedge that we planted in January 2006 grew very well this year so we were pleased to have our best turnout for several months to help with the annual pruning. As in previous years the cuttings were placed in bags by the gate for our Park Keeper to take away next week. It was a cloudy start to the morning but the sun came out in time for well deserved coffe and biscuits at the end of the session. A low turnout on a cold morning with the threat of showers after a very cold week. We managed to clear a small amount of bramble and saplings from Sally's Glade before a heavy shower meant calling an early close. We were again lucky with a dry Saturday after a wet Friday. The rain had reduced the number of people celebrating the night before so there was less fireworks litter to collect than we expected. We cleared yet more bramble and saplings from the area of broom above Sally's Glade. Some of the group also helped Gynormous Rawkus set up for their kite making event. On a dry morning following a very wet Friday and before more rain forecast for Sunday we returned to clear more bramble from the area of broom above Sally's Glade. Two of the team repaired one of the steps on the 'DOE' path in Troopers Hill Woods before joining us in the bramble. The main focus for the day was bramble and saplings at the top of the area of broom above Sally's Glade. We also cleared some litter as we walked up over the hill, much of it from a party last night. A heavy shower at 10am reduced the turnout this morning and meant a late start but the rain stopped to allow five of our regulars to fix the new Green Flag to the flag pole. With the new flag flying we turned our attention to some saplings in the grassland and also cleared the small quantity of litter from the area of the hill around the chimney and adjacent to the allotments. When Friends of Troopers Hill first started we spent a lot of time litter picking. Thanks to the help of our 'parkie' Julian; dog walkers who regularly clear litter in the mornings and everyone who uses the hill and takes their litter home, our litter pickers now have much less to do. The morning finished with coffee and biscuits on one of the benches near the chimney. Another warm summer morning, the main focus for today was bracken where it is spreading into areas of heather and broom. The bulk of the bracken is strimmed by our 'parkie' working for Bristol Parks, but we can remove the growth at the edges amongst the heather and broom. If the bracken is cut regularly during the growing season the root stock is weakened so that eventually it does not regrow. We also cut some saplings in the gully and cleared some litter from the hill and Troopers Hill Field. On a very warm morning the day's task was a sapling hunt. Working across the grassland starting from entrance E we cleared many oak and hawthorn saplings from the south west section of the hill. If these saplings are allowed to grow unchecked the grassland and heathland which is the most important habitat on Troopers Hill will be lost. It has become a tradition that for the May work party we head for Sally's Glade where the broom always looks good at this time of year with its yellow flowers. This year we removed lots of bramble and also some quite large saplings. There is more to do here so we may well return in June. Following Friday's morning rain that led to the Good Friday service being moved to the church we were pleased to be able to complete this work party before the rain came down again - the coffee and biscuits were served sitting in a car. We cleared lots of bramble from the area of broom by the steps from the lower chimney. Some welcome Spring sunshine but with a cold wind. We kept ourselves warm by clearing bramble from the steep slopes near the gorse at the top of the steps from entrance E. This is an area where a lot of bramble has been cleared by the Bristol Parks team over the last few weeks. We concentrated on clearing bramble from amongst the broom. The bramble was left in large bags by the fence for Bristol Parks to collect next week. The main focus for today was the pruning of the Greendown hedge that we had planted in January 2006. There is plenty of last year's mulch left and the thicker hedge is discouraging weed growth so we have decided that there is no need to mulch the hedge this year. After so many work parties over the last few months being impacted by the weather it was good to have a dry day, though there was a cold wind. Once the hedge was complete we turned our attention to some of the bramble that was invading the heather behind the large oak tree on the edge of the heathland. We also removed a small oak tree that was growing in the heather. During the last couple of weeks there as also been a lot of excellent work carried out by the Bristol Parks team. The main focus of their work has been to clear bramble regrowth in the areas of scrub cleared over the last two winters. They have also cut back some of last year's bracken growth in compartment 8 to expose the rhizomes to frost and allow the new growth to be cut more easily this year. This work party was cancelled due to the snow and ice. Something different for this month. We took part in a tree planting record attempt as part of the official opening of the new play area on Troopers Hill Field. Photographs and more details here. This work party became a dash to get some daffodil and crocus bulbs planted on Troopers Hill Field before the forecast heavy showers arrived. The bulbs were planted on the bank alongside the track that leads across the Field either side of the red bench by the path into the woods. We were just planting the last of the bulbs when the first shower arrived at 10.45. The team included 4yr old Luke who became the first person to help at a Work Party who wasn't born when Friends of Troopers Hill was formed in 2003! Our thanks to Bristol Parks for donating the bulbs. We also cleared the remains of fireworks from last night from the hill, though many had already been collected so there was less to do than in previous years - thanks again to all the dog walkers and others who play their part in keeping the hill clean and tidy. Photographs of the daffodil planting here. Although five of our regulars braved the wet weather, further rain meant that we had to call a halt after only an hour of clearing saplings. In some morning sunshine we cleared several saplings from an area of grassland near Sally's Glade. We were fortunate to see a common lizard on some heather at the edge of the broom and there was also a green frog hopping around. Despite the forecast rain a small group turned up and took advantage of a dry spell to clear some bracken and saplings in the gully. This work party focused on areas of bracken where it was growing amongst the heather. Our resident parkie, Julian, has been cutting some of the large areas regularly and we are able to do our bit by covering areas where it needs to be cut or pulled by hand. Meanwhile our DoE students continued their work on the steps in Troopers Hill Woods. Due to the morning's heavy rain this work party had to be cancelled. With the broom looking magnificent with its yellow flowers the main group, including our DoE pupils, did some more work in Sally's Glade. We also removed some cherry saplings from near the path to the lower stack and did a litter pick. Under warm spring sunshine we cleared some bramble and saplings in Sally's Glade. Our DoE pupils also carried out further work on the steps on the 'Doe' path on Good Friday and on the evening of 22 April. Having pruned the hedge last month, the main task for today was weeding and mulching. We also cut down a large holm oak sapling and cleared some bramble and other small saplings from near the path parallel to Troopers Hill Rd. Our D of E pupils were unable to join us on the Saturday but did their own work parties to build more steps on the path on Sun 8th and Sat 21st March. Removal of all tree species growing in scrub areas before maturity. This work party was postponed from the 7th February due to the snow and ice (see photos here). Two weeks later the contrast was amazing with a warm spring like day. Our main task was to prune the Greendown hedge which we had planted three years earlier. We are very pleased to be joined again this year by pupils from John Cabot Academy who are taking part in the Duke of Edinburgh's Award scheme. This group will continue the work started last year to re-establish the path from Troopers Hill Field into the woodland. The path has become very well used and needs some additional steps at the top. As an introduction to the hill for their first visit the group carried out a litter pick. This was another very frosty morning at the end of a long spell of very cold weather. We completed the work we started last month clearing bramble from the area of broom. A cold but sunny morning, most of the group concentrated on the area of broom to the left of the path up from the lower chimney. We have worked in this area several times and have prevented it from becoming and area of just bramble. We also removed the old sign at the entrance from the Field following the installation of the new sign in October and cleared some bramble from the ant hill area at the top of the hill while we were there. A very cold but dry morning with the rain again holding off until we had finished. We continued clearing the bramble and some saplings from the area above the steps from Troopers Hill Road that we worked on last month. Our resident 'parkie' Julian had also cleared the large area of bracken here since last month. This Work Party marked exactly five years since our first litter pick which was organised by Sally Oldfield in October 2003. We were lucky enough to miss the wet weather which, as forecast, started within an hour of us finishing. We cleared the bramble and some saplings from the area above the steps from Troopers Hill Road. This is an area that was turning into a bank of bramble, hawthorn and oak saplings but thanks to our efforts of the past few years there is now new broom growing here. Photographs of the day can be seen here. Although the rain stopped and there was even a brief burst of sunshine just before 10am the heavy overnight rain had left the hill too wet for us to work safely and therefore the Work Party was cancelled. A lovely evening – we sat on top of the hill setting the world to rights drinking coffee after doing a good bit of work tackling encroaching bramble and saplings from an area of ant-hills near the top. A cloudy morning but at least the showers had passed before our 10am start. Our first task was to put up the new 2008/9 Green Flag. We then moved into the gully to again cut bracken from the edges of areas where it is spreading into the heather and grassland and to cut some of the small saplings and bramble in the grassland areas. The morning finshed with coffee and biscuits while watching the Bristol Parks' contractor clear pick up the grass following the hay cut of the area of grassland next to Greendown. An enjoyable evening was spent first pruning the Greendown Hedge which has grown really well this year. Once this was complete we moved to the area of grassland near Sally's Glade. The forecast showers kept away and we even had some welcome sunshine. We split into two groups - the first removed ivy from the rock faces in the gully and then cleared some saplings, bracken and bramble from the surrounding area. 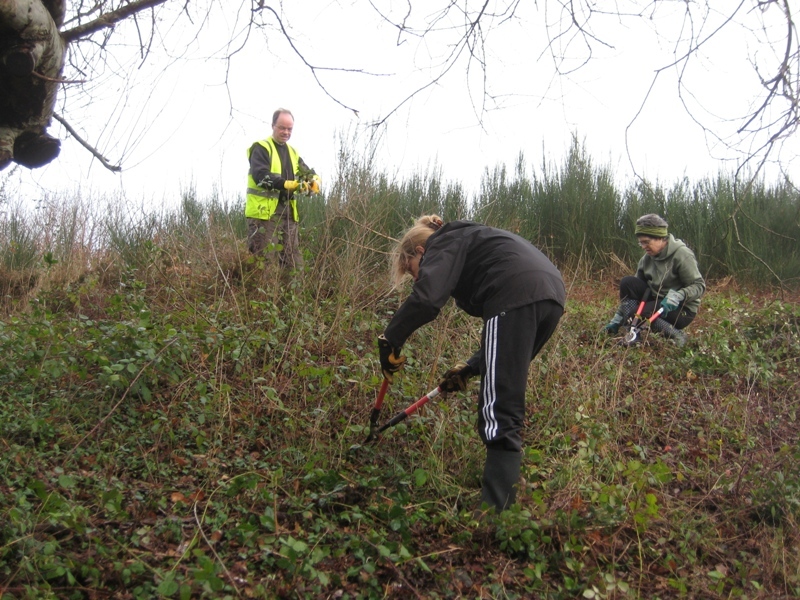 Meanwhile the second group worked in Sally's Glade and the nearby grassland again clearing bramble and saplings. While Susan & Kit were working with the Scouts to prepare for the Trooping the Hill event on Saturday a group of us removed several small saplings and some bramble from the grassland and heathland below the chimney. We also cut a small channel at the side of the path to help reduce the erosion of the path that has been happening after heavy rain. A warm and sunny morning. One group cut bracken from the edges of two areas where it is spreading into the heather and grassland. Meanwhile a second group was clearing saplings including cherry and oak from beside the path from the lower chimney. A small group on this evening work party removed lots of small seedlings of holm oak, oak and silver birch from the sides of the gully. As has become traditional for our May Work Party the work focused on bramble and hawthorn scrub in Sally's Glade. There were also several Holm Oak saplings to remove. We were again joined by two students from UWE who got to explore the hill while doing a litter pick. A rather grey day for our second Sunday work party this year - but at least it was dry. This work party saw the conclusion of our Duke of Edinburgh's Award project to build steps on the path through Troopers Hill Woods. The rest of the group cleared some bramble from the grassland near the entrance from Troopers Hill Field and then moved to the steep slopes above the nursery where we cleared some more Holm Oak and other saplings. While our DoE volunteers from John Cabot Academy continued their project to build steps on the path into Troopers Hill Woods; the rest of the group cut saplings and bramble from various areas on the hill. The areas cleared included the steep slopes above the nursery where there were many holm oak saplings. Since we are now in the bird nesting season we were careful to avoid dense areas of bramble. While our young DoE volunteers continued their project by building two steps on the path; the rest of the group started the session by spreading mulch along the Greendown hedge. As in previous years the mulch had been delivered on the previous day by Bristol Parks. Today's excellent turnout, which matched the largest number we have ever had on a work party, meant that we had finished by 11am. We then moved to clear some more bramble from the area in compartments 8 & 9 that we started at the afternoon work party in February. Today's efforts brought the total number of volunteer hours at work parties since we started in 2003 to over 1300 - thanks again to everyone. This was the first of two Sunday afternoon work parties we have planned for this Spring. Most of us concentrated our efforts on the area of broom to the left of the path from the lower chimney that we had worked on in January. We also cut down a holm oak from the other side of the path and cleared some bramble from the stonecrop. The stonecrop is home to a small fly Phytomyza sedi and Troopers Hill is the only place in the UK that this fly has been found. Meanwhile the DoE project to clear the path from Troopers Hill Field to Troopers Hill Woods continued. Our young volunteers were lucky enough to be visted by a deer that came to see what they were doing. We were very pleased to be joined by two year-10 pupils from John Cabot Academy who are taking part in the Duke of Edinburgh's Award scheme and by two students from UWE. The main group concentrated on pruning and weeding the hedge at Greendown, we also planted some new holly and hawthorn to fill a gap that had appeared. At the top end of the hedge there was a lot of bramble to cut back. The DofE project is to re-establish the path from Troopers Hill Field into the woodland. This work will be ongoing over the next couple on months and will include building some steps. The path leads from the glade that we created last winter and will give another route onto the Hill from the Field. A bright and frosty morning after a very wet Friday. We started with the prize giving for our photo competition. We were very pleased that our young winners Harry and Amy were then able to join us on the work party. We concentrated our efforts on the area of broom to the left of the path from the lower chimney, this area is relatively flat so the wet ground wasn't so much of a problem. A photograph of some of the team relaxing after the hard work is shown here. Heavy showers after a lot of overnight rain meant that this month's work party had to be cancelled. Warm or even hot sunshine on a fabulous November morning. 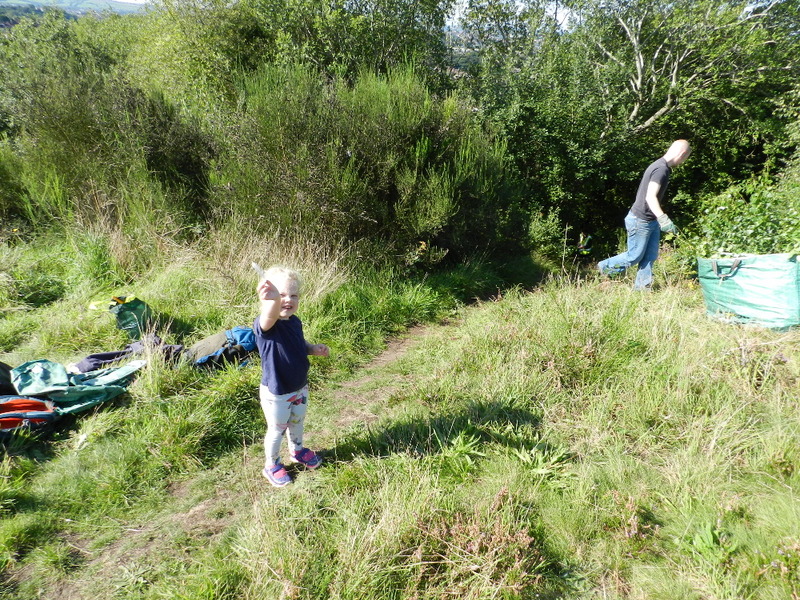 Two of the group did a quick check over the hill for litter before joining in with the rest of us in clearing the bramble re-growth from the area at the top of the steps leading from Entrance E. This is an area with old broom that had become completely choked with bramble. It was pleasing to see our efforts of last year being rewarded with new broom plants growing. As well as the bramble some oak saplings were also removed. With lots of our regulars (including our Chair) suffering from the various bugs that are going around there was only a small group this month, though it was pleasing to welcome a new face. We concentrated our efforts on clearing the bracken at the entrance to the Gully. Much of this bracken had been cut by Julian of Bristol Contract Services on his regular visits to the site with his strimmer. We were able to clear the remaining areas where the bracken was mixed with the heather using loppers. Now that the edge of the heather can be seen we hope to be able to keep next year's regrowth in check and to eventually eradicate the braken all together in accordance with the Management Plan. Having completed our work in this area we spent the last half hour before well deserved coffee and biscuits cutting saplings further up the gully. On a cloudy but warm morning we returned to Sally's glade to clear some more bramble and scrub. This time we concentrated on the lower part of the glade below the path. A small group also bashed down some of the bracken regrowth in Compartment 5 and cut down some isolated gorse bushes that had appeared amonst the heather. For both these work parties we returned again to work on bramble, hawthorn and oak scrub in Sally's Glade. On the Saturday we first had a photo taken with the Green Flag which can be seen on our Green Flag Award Page. On a warm but cloudy morning it was good to have a sit down after our labours and enjoy our coffee and biscuits. There are some photos of the work in progress here. Six of us continued this work on the Thursday evening; concentrating this time on the area at the top of the glade. A dry and sunny day after a very wet June saw us working in three areas. One group first flattened some bracken before moving on to remove some saplings including several holm oaks from the steep slopes above the nursery. Meanwhile a second group was clearing bramble and saplings including cherry from beside the path from the lower chimney. A particular aim of this group was to clear the stonecrop which is home to the small fly recorded as a 'first for GB' in last year's invertebrate report. A small group of us managed to miss the showers on a cloudy summer evening and clear some saplings from the north side of the gully. A warm sunny June morning meant that we were very grateful for the shade of the broom as we cut the regrowth of bramble from the area we cleared in the winter. Two evening work parties, the first bashing down some of the bracken in compartment 5 at the top of the steps from entrance E and the second cutting more bracken and saplings from areas of heathland. A smaller group than recently due to the clash with the Bank Holiday weekend but we were pleased to welcome two new faces. Over 60 people have now taken part in our Work Parties over the past three years, our thanks to all of you. The work focused on bramble and hawthorn scrub in Sally's Glade which is in compartments 10 and 11 in the Management Plan. This is a wonderful spot to work at this time of year with the broom in flower. This was a trial to guage interest in evening work parties. We had a very enjoyable evening cutting bramble from wherre it was encroaching into an area of grassland with lots of anthills on the left of the path from Troopers Hill Field in Compartment 1. Once the tools had been put away we sat and enjoyed the view over the hill while drinking a couple of glasses of wine. We hope to run more evening work parties through the summer - so watch this space! Cut back the bramble to retain a 5m wide strip close to the boundary to form a security barrier with the allotments and also diversify wildlife habitat on site. This month's work party was delayed by a week because of Easter. In previous Aprils we have carried out a 'Spring Clean'. We were very pleased that this was not necessary this year. A small group did some litter picking, but apart from a large duvet only two bags of rubbish were recovered. This is a real indication of the success of Friends of Troopers Hill and our friends in Bristol Parks in making Troopers Hill look more cared for and encouraging people to treat the site with the respect it deserves. Many thanks to every one who as helped especially all those dog walkers who pick up cans and bottles on their morning walks. 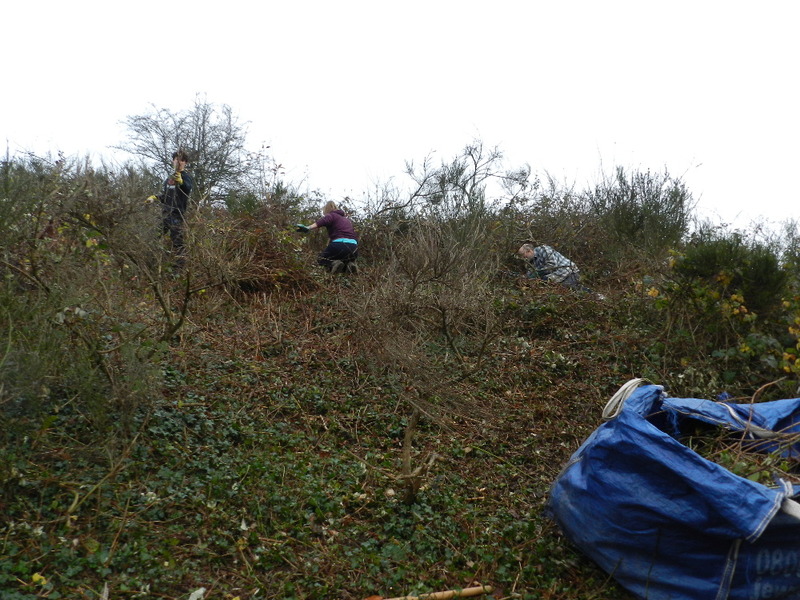 These photos show a second group cutting the bramble regrowth in the area we cleared over the winter. We also moved some of the bramble we cut previously so that Bristol Parks could remove it later. A third group covered the site cutting holm oak saplings, they were pursued by a BBC film crew - watch out for 'Nature in Britain' in the autumn. The photos also show the lizard we found and the whole group sitting in the unusually hot Spring sunshine enjoying coffee and biscuits afterwards. Thanks must also go to Zoe from BTCV who came along to audit our Health & Safety procedures to ensure that we were working safely and in accordance with Bristol City Council's requirements. The area where we cut the bramble is part of the area designated in the 2007 Management Plan as Compartment 5. The work we have done during the winter to remove bramble and saplings in this area is in accordance with the 'Work Guidelines' (section 7.1) for this compartment to remove competition with the heathland flora and to prevent scrub from maturing into woodland. These Work Guidlines summarise the work needed to achieve the Aims and Objectives for the site set out in section 7.2 of the plan. In particular our work helps to achieve aim 7.2.2 to conserve and where possible enhance the extent and quality of acidic grassland and heath habitats. The plan sets out objectives that will help to achieve the aims. So that everyone can see how our work relates to the Management Plan we shall list the compartments where we have worked and the objectives that we have focused on under the reports for this and future work parties. Once the work to the hedge had been completed we split into two groups; one loaded cut bramble from last month into bags for removal while the other group cleared the new path through Gillian's glade and also spread wood chip and the gate onto Troopers Hill Field from Summerhill Terrace. Bristol Park's contractors - BCS - have also been working hard on Troopers Hill during the last month. These photos show some before and after shots of the areas they have cleared. Thanks to BCS and Bristol Parks for a great job! This work has all been carried out in accordance with the agreed Management Plan for the hill. Our main aim is to prevent the spread of scrub on to the acid grassland and heathland and where possible to restore areas of this habitat. There was a very interesting discussion about the restoration of heathland on a much larger scale in Dorset on Radio 4's Home Planet programme on 27th February. You can listen to the programme via the Radio 4 website. A small extra Work Party was also held on Fri 16th March to add some more mulch to the hedge. We continued with the work we were doing last week in both locations. At Gillian's Glade we have now cut a path through the bramble to connect with the paths in the wood - though it needs a bit more work to make it easily passable. On the hill itself we got the last of the bramble out of the area of broom and again filled four bags for Bristol Parks' contractors to take away. The rest of the bramble we left in heaps to remove next time. Everyone was pleased to see that the contractors had done a lot of work on the hill during the week clearing other areas of bramble on the site. These photos show work in progress and this part of the hill as it was in November and as it is now. As in December we split between two sites. On Troopers Hill Field more of "Gillian's" glade was cleared in front of one of the new benches funded through Akzo Nobel's Global Community Programme. Alan led the way with the slasher and loppers. The rest of the group cleared more bramble from the broom and cut down several saplings. In accordance with the reconmendations of the latest invertebrate report (see Hill Wildlife) we removed the cut bramble from the site rather than allowing it to rot down. Many thanks to Bristol Parks for arranging to supply bags for the bramble and then having them taken away. The work party on 6th Jan was cancelled due to rain but we made up for it by holding an extra session on the following week. 14 very enthusiastic volunteers spent two enjoyable hours cutting bramble and several saplings from our favourite area of broom. A special thank you our two young helpers (aged 8 & 11) who worked very hard cutting up the holm oak that we felled on 2nd Dec. If you have any comments on the management of Troopers Hill or any suggestions for future work parties please email .